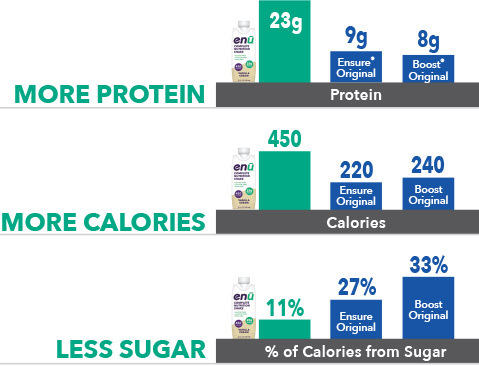 ENU Nutrition Shakes are optimized meal replacement shakes. High Protein and Reduced Sugar...Developed with Dietitians from Leading Cancer Centers to deliver extra nutrition when people need it most! * One 11oz bottle of Vanilla ENU Nutritional Shake compared to one 8oz bottle of Ensure Original and Boost Original Nutrition Shakes. Ensure and Boost are not registered trademarks of Trovita Health Science.